Estrovive Reviews - Is it a Scam or Legit? Estrovive is an all-natural supplement from Cellular Research Institute that claims to reduce menopause symptoms like hot flashes, mood swings, and more. Estrovive menopause relief supplement claims to use strategically developed natural ingredients that are back by science to help relieve and eliminate your menopausal symptoms. All you have to do it take two capsules of Estrovive in the morning with breakfast, and you’ll experience best results after using it continuously for 60 days. How does it work? According to the company, they spent 18 months researching the best herbal extracts, along with which combinations were most effective. As a result, they claim you can expect Estrovive to help you regulate body heat, sleep better, lose weight, and feel happier and more balanced. We’re told it will also increase libido, boost energy and concentration, increase joint mobility, and boost hormonal balance. And best of all, the company tells us that Estrovive causes no known side effects or interactions! Menopause is a completely natural process that most women will experience at some point in their life, but that doesn’t make it any less uncomfortable. Will Estrovive’s natural extracts really help you find some relief, or is it a bunch of hogwash? To start, let’s quickly discuss the underlying causes of menopause. What Is Menopause? What Causes It? Officially, menopause is defined as “the point in time when menstrual cycles permanently cease due to the natural depletion of ovarian oocytes from aging,” which is generally diagnosed after a woman has missed her period for 12 consecutive months. Because menopause by its very nature represents a fairly drastic hormonal change (the decrease of estrogen), a woman’s body can briefly experience unpleasant side effects like hot flashes, night sweats, mood swings and depression, insomnia, vaginal dryness, changes in the texture of skin, and more. Other common side effects include increased risk of osteoporosis and cardiovascular disease. While most of these side effects will decrease (and may even disappear altogether) soon after menopause, the reality is that they can have a big impact while they’re happening. To this extent, can anything contained in Estrovive help? What Ingredients Does Estrovive Contain? Of all Estrovive’s ingredients, based on the available clinical evidence, soy isoflavones seems to be the one that might provide the most benefits. It’s been shown to address many feminine health issues, such as decreasing the risk of breast cancer, reducing blood sugar in diabetics, lowering cholesterol, and addressing some menopausal symptoms. Similarly, black cohosh may also be effective for reducing some menopausal symptoms; specifically, hot flashes. However, outside of a specific supplement (Remifemin), this might not be the case as clinical evidence is either limited or contradictory. Many women also take Dong Quai, although the clinical evidence is also mixed. Vitex Berry may help some side effects related to PMS, such as breast tenderness, depression or mood swings, and anger, although nothing specifically related to menopause. 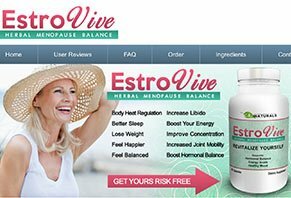 Outside of this, it seems that there isn’t enough clinical evidence available showing that any of Estrovive’s ingredients are effective for any menopause-related symptoms (or for anything at all, in more than one instance). What about the company’s claim that “clinical and published studies tells us this is a great product with 98% success rate in relieving menopause symptoms”? Assuming this is true, it would make Estrovive more effective than any other menopause supplement out there (more about those in a second), as well as for prescription medications. Unfortunately, the company doesn’t seem to think it’s important to back up this claim with any clinical evidence, so we can’t be sure that it holds any water. Will Estrovive Cause Any Side Effects? Most of Estrovive’s ingredients should be safe, with mild digestive upset as the most common side effect. Obviously, Estrovive contains soy, and long-term use of dietary soy products (more than 6 months) may be unsafe. Effectiveness and side effects aside, is Estrovive expensive? Where Can You Buy Estrovive? How Much Does It Cost? Regardless of the amount you purchase, Estrovive comes with a 90-day money back guarantee—at least according to the supplement’s home page. On the other hand, the Terms tells us that it’s 4 months. For clarification, we called customer service at 855-240-8889 and verified that it’s 4 months. Note: If you request a refund, be sure to include your order ID and first and last name with your return package. Given the general lack of clinical evidence for many of ingredients, along with its price, are customers satisfied with Estrovive? Why Are There So Few Online Reviews for Estrovive? Considering the fact that the company claims “96% of women who purchase Estrovive comeback and re-purchase,” we expected quite a lot of online feedback for the supplement. However, outside of the standard affiliate websites, the only Estrovive reviews we found were on Amazon, where it had a 4.8-star average rating, based on 21 reviews. There, most compliments seemed to reference positive results (e.g. reduced side effects related to menopause). The single negative review claimed they didn’t experience anything, and that they felt they wasted their money. Pro tip: Essentially all of Estrovive’s positive reviews on Amazon contained a lot of poor grammar, misspellings, and incorrect punctuation, leading us to believe they were written by non-native English speakers. We’re certainly not making any accusations here, but we’ve learned that these are some of the hallmarks of fake customer reviews. From a company perspective, Estrovive is manufactured by Cellular Research Institute, based out of Utah. The company seems to create a variety of different supplements, such as Vitality Colostrum, Dual Action Cleanse, and 3G Factor. Unfortunately, they weren’t listed with the Better Business Bureau at the time of our research. Should You Use Estrovive to Address Menopausal Symptoms? If you type “menopause supplement” into your favorite search engine, you’ll quickly learn that there are thousands of supplements like Estrovive out there, each claiming to outperform the rest. However, based on the available clinical evidence, it seems like they soy isoflavones and black cohosh nearly all of these contain might offer the best chance of reducing your symptoms. With this in mind, is there anything especially unique about Estrovive? While it’s positive that the manufacturer provides a complete label and a friendly customer service department—based on the available evidence for their ingredients—there doesn’t appear to be anything especially valuable or effective about the supplement. The good news is that the company seems to stand behind Estrovive with a 4-month return policy, so you’ll only be out a few bucks in S&H for giving it a try. Just be sure to speak with your doctor first! Write a Review for Estrovive!